I happened to be in Allentown. PA on business and noticed a lot of beautiful old Buicks parked in the Motel parking lot where I was staying. I spotted three guys hanging out in the parking lot by some Buick Reatta's, including a couple of Reatta Convertibles and headed over to see what was up. They told me they were there for the 50th Anniversary BCA meet. Of all times not to have my camera gear! My I phone would have to do. I saw a few more folks at the motel breakfast bar the next morning and they invited me to stop over to the grounds where the meet was being held. (As it turns out, the bank I work for was one of the sponsors, so I was a honorary guest , so to speak) Too bad I don't still have my 1972 Buick GS 455 as it would fit right in with the group. This short post will have some of what I captured. One of the highlights was a '41 Buick convertible in Sienna Rust with a green interior. According to the owner, it is the only one in existence with that color combination just as it came from the factory! The other highlight for me was a 1953 Buick Wildcat- there's only two of them. My only regret is that I had to fly back to Florida on Friday and was not able to take in the full meet on Saturday. The pictures I have reflect the setting up for the event. Thank you Buick owners for the warm welcome and interesting conversations. Will update images with better resolution after I return home to my photo equipment. 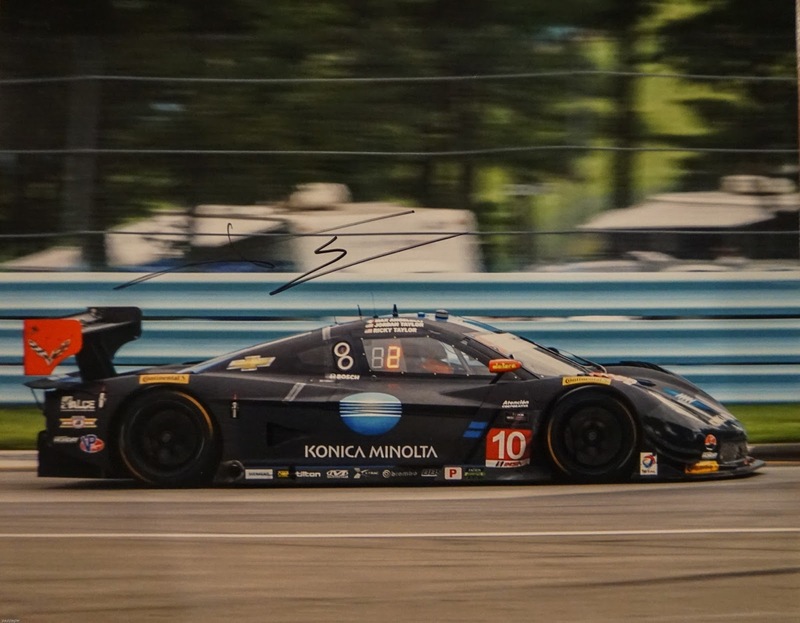 Ah but for a year- yes last year I was at IMSA's Sahlen's Six Hours of The Glen and loved every minute of it. This year I was stuck in St. Petersburg, Florida working at the office. 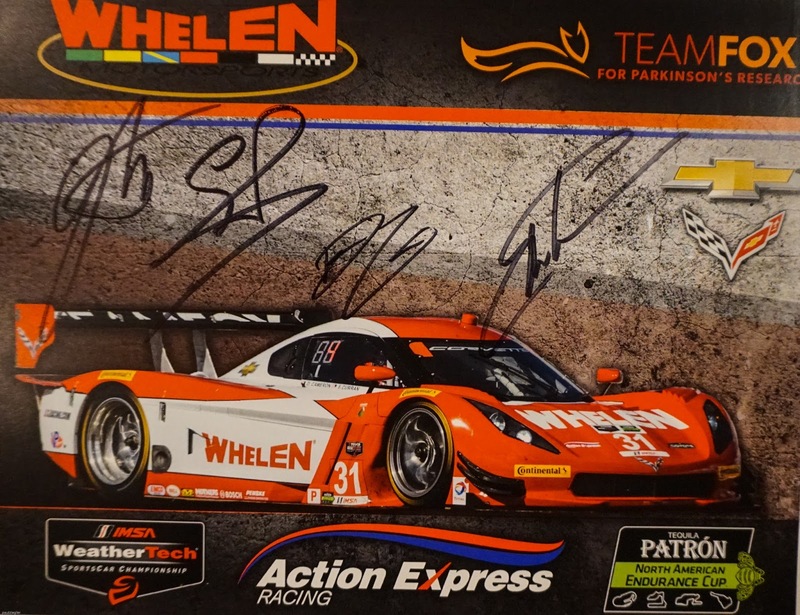 You can't have everything so I promise next year I will be back at the Glen. In fact I will be back at the Glen Labor Day weekend when the Indy Cars are there to race for the first time in years. I can't wait. 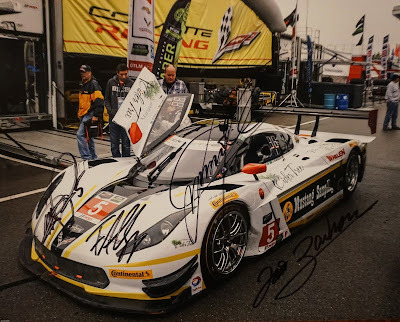 However I digress from the subject- This year's prototype class was won by the Action Express Corvette and I'm proud to bring you the following photo, autographed by drivers Joao Barbosa and Christian Fittipaldi. Sometimes it takes a while to put it all together. 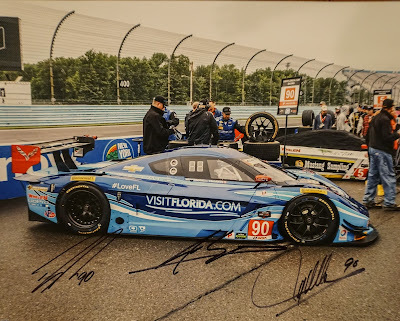 I took the picture in June 2015 at the Glen, then had it with me at the autograph session for the 24 Hours of Daytona in January 2016, so I have it here for you to enjoy. 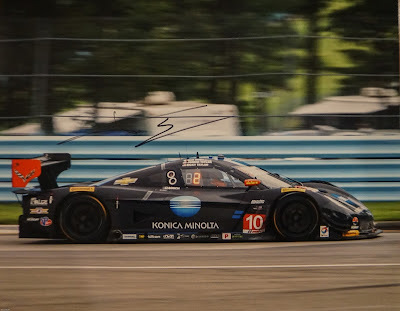 Not to be lax, in similar fashion I also have for you the #10 Wayne Taylor Racing Konica Minolta Corvette Prototype autographed by Jordon Taylor along with the Visit Florida.com entry autographed by its drivers. 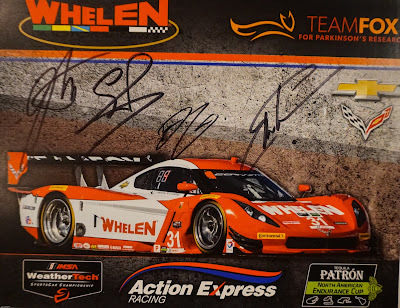 And finally- being a little lax, I have an autographed fan photo of the #31 Whelen version of the other Corvette Prototype by Action Express Racing I obtained at Daytona in January 2016. See above link for the story and all the stats.